Essential to showcasing a property with exceptional architecture, landscaping or expansive views. Attention is given to ambient lighting conditions, color correction and framing of the image.Some properties possess scenic views and an environmental ambiance. Time is critical to conveying that experience. 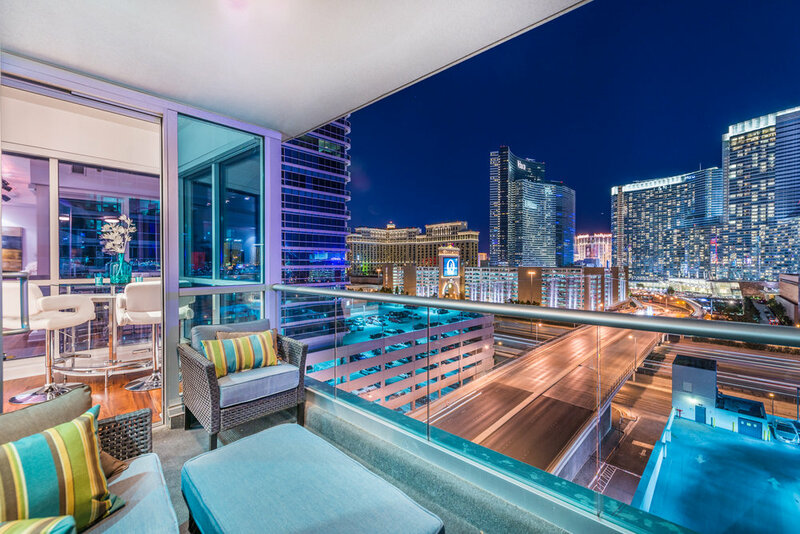 Las Vegas is blessed with dramatic sunlit mountain ranges, mesmerizing clouds and vibrant city lights of the Las Vegas Strip. This type of photography is labor intensive and requires punctuality. However, the results are often breathtaking. A' la Carte photography, is intended as a supplement to the quick-shoot packages. Situations arise, where neither package will suite your needs. One may supplement these packages, on a per photo basis. A quick-shoot is intended for those who require quality photographs, under time or budgetary constraints. The photographer arrives at a scheduled time and photographs the entire property within (1) one hour, depending on the layout of the property. A quick-shoot consists of a total of 25 interior and exterior photographs. The distribution of photographs is dependent on the size and construction of the property. In general, a 2,000 Sq-ft property will require 6-8 exterior photos, front/rear and 17-19 interior photos. The interior photos will cover the master bedroom/bath, the living-room, kitchen, and other notable features, at the photographers discretion, unless requested to do otherwise. Scheduling is required for this type of shoot, as the photographer requires access to the interior of the property. Acceptable means of access are; presence of the occupant/owner, or lock-box access code provided by realtor/property management personnel. A full-shoot is intended for anyone who wishes display one's property in attractive detail. General applications of a full-shoot include; virtual tours/slideshows, website publication, printed materials and MLS photographs. A full-shoot consists of a sufficient number of photographs to describe the property in detail. The number of photographs varies with the size and complexity of the architecture. On average, a 2,000 Sq-ft property requires approximately (25) twenty-five photographs. The photographer uses professional lighting and photography equipment to create high quality images. Care is taken to show relationships between living spaces, while highlighting attractive aesthetic features of the home. The photographer will capture both exteriors and interiors of the property in multiple perspectives, to provide an immersive viewing experience. A Premium-shoot is an intensive photography project, which requires a number of hours to produce. On average, the photographer requires (2) hours per 1,000 Sq-ft of property. Scheduling is required for this type of shoot, as the photographer requires access to the interior of the property. Acceptable means of access are; presence of the occupant/owner, or lock-box access code provided by realtor/property management personnel. A Web-tour is an ideal enhancement addition to any photographic service provided. A web- tour is an elegant way to showcase a property. It consists of a high resolution slideshow presentation of the property with music. Furthermore, it provides valuable web traffic and location data, helping your client make an informed decision. With all the features it provides, you'll appreciate the marketing value it brings. Visit my sample tours page. The link is provided below.